I am OCD as well as CLUMSY ! So in designing this station in my new small shop, I rounded the corners and inset the legs so I don’t catch my feet on the legs as I walk by. If I need to crosscut a large board on the table saw, I can park whatever tool is on the station, and fold it away against the wall. This location gives me 8.5’ on either side. For longer stock, I will use the workmate between the man doors. The 2×2 legs may look flimsy, but are very solid with the weight of the machine directly above. Nice project and out of the way when not needed. Priceless!!! Good use of the tight spot. Okay another idea for my future list. Thanks. 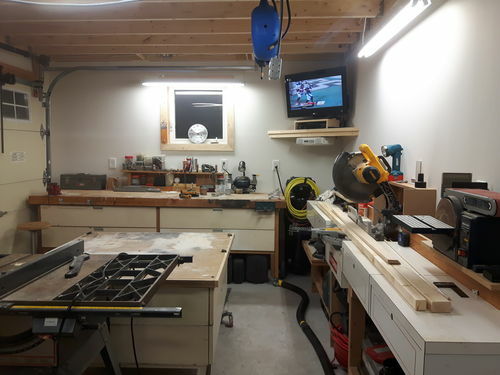 Please see my blog #5 Help.. as I plan for my move to a shop in Arizona and tools along the wall and another blog Whats in your small workshop how I will condense what I have in my one car garage to along the wall storage. the planning is going well and this could be a space saver I need since nightly the tools have to go away and the car or cars go in. Not what I have had to do before. Also see my page for any projects you might like, I have a camping table the folds that might go with your deck or deck chairs no nuts or bolts and my own design, even one made from one 2×4 and a larger 24 in version. Like those adirondack chairs I have used the woodsmith plans and since many were wedding gifts have made 17 now. Like your design the rear angle does not slope so much and adds to ease of use. Thanks guys….a work in progress. I have stacks of paper with ideas drawn out and pics saved from you guys out there. 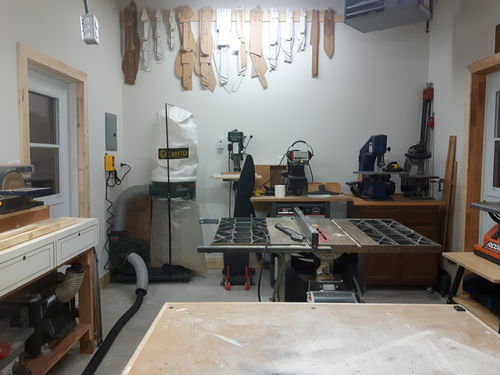 Old guy….I am fortunate to be getting more space than the old basement shop…mostly in height. I am designing french cleat systems for most of my walls, as it will give me the flexibility to relocate or expand as tools are added. I will post them here. 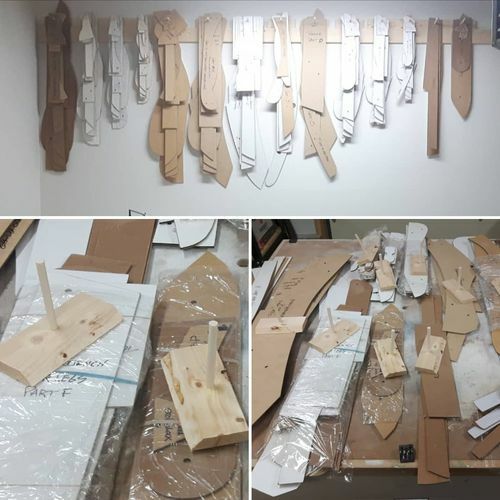 So far I have stored all my patterns high on the wall with french cleat pegs. This is the shop so far. It is the end 12’ of a 32’ deep double garage. Since the garage door takes so much wall space, I need to be efficient. All tools roll, and you can see I park a lot of them between the man doors, and roll out to use….you could do that at the end wall. I plan on storing stuff between the joists in the loft at the 9’ height….some great ideas on Pinterest. 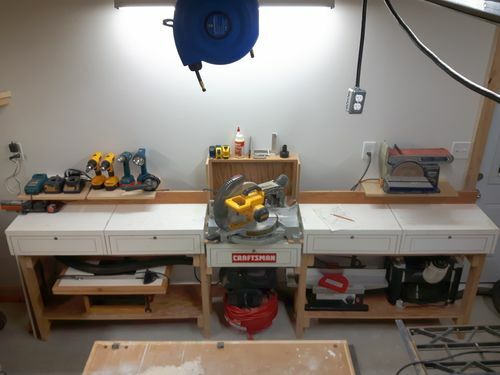 Looking at your blog pic, I suggest you build hinged work benches like my Multi Station. Make the benches so the car can get in, then add a folding front with legs like mine. Your bench top tools can slide out for access. Add a lock system to the folding front to the wall. Here is my mitre bench with tools stored underneath. I just finished closing in the dust box, and will be hanging all drills and tools on the wall above. The clamp wall will be beside the door on the right. Even the 4×4 rolls, as well as the main workbench….and it’s HEAVY. You did a nice job on this fold out table. It will be a great addition to your shop. Realy fine space saver, I could use it in my shop as well. It’s also small like yours.